First, take a moment to read the below (Or refer to linked post) And then, read my update to this post. First, I would like to start out by saying that I would hope everyone would pray for Jeff and his family…I was not aware of how serious his wreck at Knoxville was until after speaking with Judd. Since hearing the comparison of Jeff’s accident to Kevin Gobrecht’s at I-30, I have been feeling a range of emotions. Being a fan of many drivers, including Jeff and Kevin, I know how dangerous my favorite sport is. I have seen what happens within the racing community when something happens to one of their own. Organizations like the York County Racing Club raise money for injured drivers, and we, as fans, should support this endeavor. It still surprises me how many people who boo a certain driver running in Central PA. And while I may not be a fan, this driver’s family is there hearing obcenaties throughout the evening. I have witnessed “haters” threatening his family while he is stopped on the track during a red flag. This behavior is appalling. Now, we all have our pet peeves at different tracks…but when so-called fans resort to this type of behavior, something has to be done. However, this problem has also surfaced on the various message boards in a different way. Not only do we have this particular issue, but the up-and-comers are facing hate as well. Granted, some drivers DO need to improve….but the only way to improve is to get seat time. Drivers coming up from one division to another also face scrutiny. Many of these drivers have succeeded in the lower ranks of open wheel racing and moved up appearing at Williams Grove and Lincoln. Those on the message boards criticize these drivers mercilessly. I am not sure how many of those who are posting actually drive a racecar of any kind, but after hearing the comments, I would doubt they did. Racing is an expensive and dangerous sport…it takes time, effort, and practice to become competitive. I do not have access to a car to offer a challenge like one on the Grove board, but I would challenge any of these “haters” to get 10 laps to see if they could do any better. UPDATE: Dont you get it? Just because you dont root for someone does NOT mean they cheat. Arent these drivers providing you with your entertainment? Last night was the final points race for the 410s at Lincoln Speedway. The drama built as Niki Young had problems with his car all night and had to qualify through the consi. Unfortunately, Niki did not finish the consi, but was named the first alternate, and Pat Cooper dropped out to give Niki his spot. Niki had been 3rd in points. Had Fred Rahmer not gone to Knoxville he probably would have been able to breeze through with some breathing room. Both Eash and Rahmer qualified through their heats, but failed to finish in a handicap spot, and had to start the feature outside of the top 12. Fred Rahmer and Niki Young faced an uphill battle in the feature….with Niki not finishing and Fred going to the pits after an early caution, reporting out for the remainder of the race. After an entertaining feature that kept the drama building, Alan Krimes came home in victory lane. Brian Monteith was able to finish in front of Fred Rahmer, and was thereby named Points Champion. What a wonderful racing season it has turned out to be! While lurking on the Williams Grove Speedway message boards-as I usually do….I heard about this amazing race a couple of Fridays ago. During the final laps of the A-Main on August 22nd, Fred Rahmer and Brian Monteith were racing for the lead. Coming down the backstretch, Fred made contact with a lapped car, and — let’s just say, it’s hard to beleive what occurred. Fred never missed a beat – never slowed down – and won the race. Anyway, after hearing this amazing save from those I know who were at the Grove (and on the backstretch) I HAD to get this race and see for myself. It is a “miracle” that Fred saved his car after riding up the lapped car. Those who were on the backstretch could actually see the bottom of his car. Fred NEVER slowed, racing Monteith for the lead. 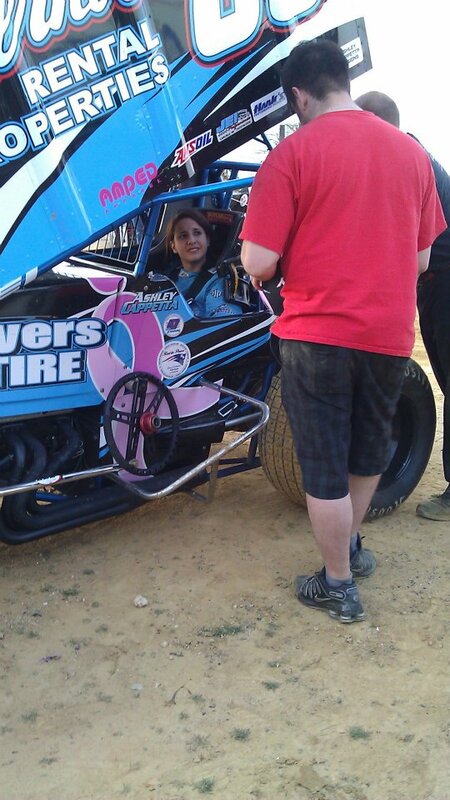 Now, I don’t consider myself to be a Rahmer fan, but all I can say is….what a talented driver! Cheers to him on the win. He certainly desrved it. Another cheer to Fred for the mention of Jeff Shepard. I know the entire racing community wishes him well, but it is special when a fierce competitor recognizes someone. We Did It! Shepard is home! Comments Off on We Did It! Shepard is home! It amazes me that Jeff Shepard fans and the racing community in general have raised enough money to pay off his air ambulance bill AND physical therapy bill. ($17,000 + $12,000 = $29,000) Wow! I beleive that this really helped the Shepard family. Im sure it alleviates alot of the stress of having the money issue hanging over them while trying to get through a difficult time anyway. Money can certainly stress you out and hinder recovery. If you dont beleive that, talk to me sometime. Jeff certainly improved enough that he is able to leave the hospital in Baltimore and return home. He will still have to go to therapy several times a week, but being home is a huge improvement. As I have mentioned many times before, even though I personally know those who didnt root for Jeff, they still came forward to support someone who provided years of racing entertainment. Last Saturday night, when Rahmer came into our section, even those who openly boo him, clapped and gave him money for Jeff. It is also worth noting that money to help the family didnt all come from Central PA. Not only did racetracks all over the US raise money, but money was raised even in Australia! Even though it is sad when the racing community has to come together like this, it is also why I love the sport so much. There is no other sport like this.